This morning, my 17-year-old son was up before 7, despite having filmed the varsity football semi final and arriving home late the night before. (Woohoo! The Cougars are heading for the state final next week!) Before I saw him, however, I saw the empty packets of Emergen-C and the kitchen shears strewn on the kitchen counter and knew something was up. Sure enough, this boy is sick. 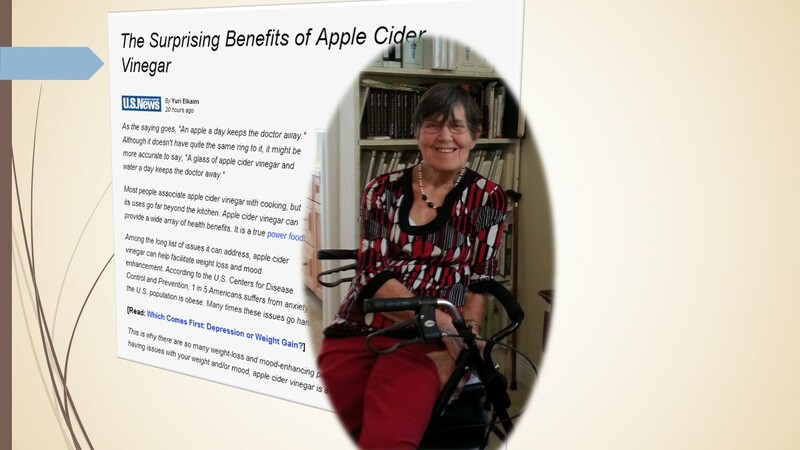 On his computer screen was a new article — published a mere 20 hours ago — proclaiming “The Surprising Benefits of Apple Cider Vinegar.” The article suggested apple cider vinegar as an aid for depression, weight loss, growth hormone production, maximizing iron absorption, and mood enhancement. The U.S. News and World Report report wouldn’t have surprised my mother. She has long thought apple cider vinegar a cure-all and suffered ridicule at times because of it. As young as age 4, I remember my mother drinking apple cider vinegar in water; to make it more palatable to my young self, she made mine with vinegar and honey. I remember little tin juice cups, laced with condensation, filled with the mixture; it wasn’t bad. We weren’t looking for mood enhancement or weight loss; my mother suggested the drink when we were sick — as my son is — or as a daily preventative to keep the doctor away. I think I will suggest to my son that raking leaves in the sun will help his illness…. along with my mother’s remedies. I wonder if he will ever attribute these home remedies to me, as if they were mine? Of course, as evidenced by the article, my mother was right — as am I. But right now I need to get to the grocery store to buy some vinegar; my throat is feeling a little scratchy too. I bought apple cider vinegar, but have yet to try it! I want to believe it is a miracle cure, but haven’t worked up the nerve to try the first sip. hee hee. Add honey. It is like Mary Poppins’ spoonful of sugar for vinegar! A friend told me she puts it in tea with honey and cinnamon. I tried it and it is good too.